The eMERGE network brings together researchers with a wide range of expertise in genomics, statistics, ethics, informatics, and clinical medicine from leading medical research institutions across the country to conduct research in genomics, including discovery, clinical implementation and public resources. eMERGE started in September 2007 and began its third phase in September 2015. The primary goal of the eMERGE Network is to develop, disseminate, and apply approaches to research that combine biorepositories with electronic medical record (EMR) systems for genomic discovery and genomic medicine implementation research. In addition, the consortium includes a focus on social and ethical issues such as privacy, confidentiality, and interactions with the broader community. eMERGE Phase I (September 2007 – July 2011) included five study investigator sites and an administrative coordinating center within one of these sites. Each site participating in the consortium led studies on the relationship between genetic variation and at least two common traits among the network participants, using the technique of genome-wide association analysis. Such studies involve testing hundreds of thousands of genetic variants called single nucleotide polymorphisms (SNPs) throughout the genome in people with and without a condition of interest. eMERGE Phase I sought to answer the question of whether electronic medical record (EMR) systems and biorepositories can serve as resources for such complex genome-wide association studies (GWAS) of disease susceptibility and therapeutic outcomes. 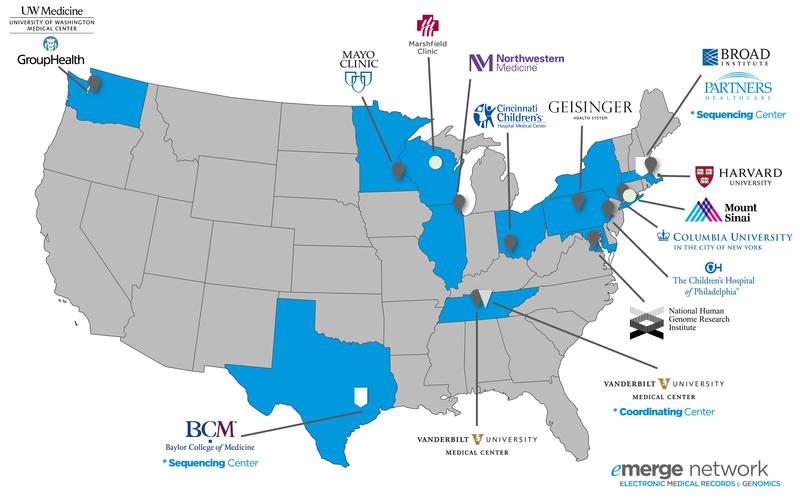 eMERGE Phase II (August 2011 – July 2015) expanded the network to include nine study investigator sites (including two pediatric sites) and a coordinating center. In addition to the continuation of GWAS studies for genomic variant discovery, the consortium sought to explore the best avenues to incorporate genetics variants into EMR for use in clinical care, to improve genetic risk assessment, prevention, diagnosis, and treatment, as well as accessibility of genomic medicine. eMERGE Phase II continued to develop algorithms for electronic phenotyping and to identify genomic variants associated with those phenotypes. eMERGE Phase II conducted two sets of clinical implementation pilot studies: 1) site specific pilots, and 2) the eMERGE network pharmacogenomics (eMERGE PGx) project, which sequenced 84 pharmacogenomics candidate genes in over 9,000 participants. Consent, education, regulation and consultation – important issues related to the use of genomic data in clinical care – were also addressed. eMERGE Phase III (September 2015 – May 2019) consists of nine study sites, two central sequencing and genotyping facilities, and a coordinating center. eMERGE III aims to continue to develop and validate electronic phenotyping algorithms for large-scale, high-throughput genomics research; to discover genetic variants related to complex traits; to disseminate results and lessons learned to the scientific community; and to deliver state-of-the-art genomic knowledge, methods, and approaches to clinical decision support and clinical care. More specifically, eMERGE Phase III aims to: 1) sequence and assess the phenotypic implication of rare variants in ~100 clinically relevant genes presumed to affect gene function in about 25,000 individuals; 2) assess the phenotypic implications of these variants, 3) integrate genetic variants into EMRs for clinical care; and 4) create community resources. Work on the eMERGE PGx project from eMERGE II will also continue in eMERGE III. In addition, eMERGE III will continue to assess health impact, cost effectiveness, and ethical, legal and social implications of reporting genetic variants on a broader population scale for patients, clinicians and healthcare institutions. LEARN MORE about eMERGE network programs here.